Saving Spalding Pets: AO6-3396 SHAGGY TERRIER MIX-BRITCHES-ADOPTED LOCALLY. AO6-3396 SHAGGY TERRIER MIX-BRITCHES-ADOPTED LOCALLY. Britches is a young adult male. He is one of those "Disney dogs" you find so often in the shelters. I don't know what his breed mix is, but he is adorable! He was very frightened today and was not really interested in interacting with me, but may be more social outside of the scary shelter. HIS LAST DAY ALIVE WILL BE NOVEMBER 29. 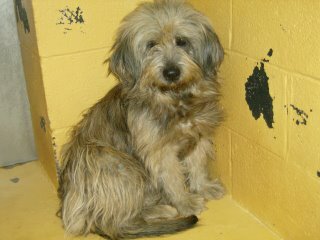 Can someone email me please at BMD0123@aol.com I know of someone in Minnesota that would LOVE to adopt this boy! She needs info though on how to arrange transport etc. My family and I live in Spokane. We lost our Shaggy Terrier several years ago after all of his 19 years with us....he was the light of the house. This little fellow looks like he really could use a good home and we sure could use a good pup. When might I come and meet him...before the 29th of November..Where is he located.